On April 13 2007, the People’s Republic of China launched the first middle earth orbiting (MEO) satellite in its Compass GNSS system, 21,550 kilometers (or about 13,200) miles above the Earth. The spacecraft began transmitting signals on three frequencies within a few days, much more quickly than operational satellites in other GNSSes. Engineers at the Centre National d’Études Spatiales (CNES, the French Space Agency) have been monitoring the newest Compass (Beidou) satellite. On April 23, they made a series of observations to characterize the signals, all of which will overlay GPS and Galileo signals’ spectra. 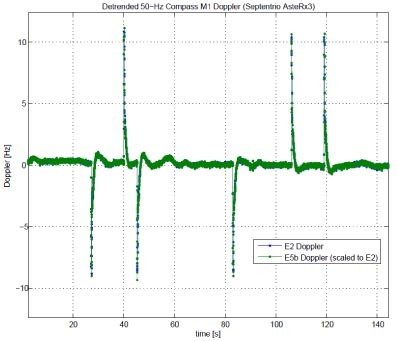 This article presents the results of those observations and a subsequent demodulation analysis of the Compass pseudorandom noise (PRN) codes. Collection of signals has enabled us to determine Compass signal structure in E2, E6, and E5b bands. All three frequencies are QPSK modulated. The in-quadrature codes were characterized: primary codes are 1-ms long and are modulated by a 20-ms secondary code. The E1 signal structure could not be determined as this signal has not yet been observed at CNES. However, the CNES dish is frequently pointed at Compass satellites so as to detect any broadcast. Observing both E2 and E1 signals simultaneously would be very instructive as it would allow us to determine if signals are generated independently or if a specific modulation is used to generate both signals.